Ok, feeling the pressure now, got to get some usable designs now. I went and completely revisited my style, but perhaps mistakenly (in the sole interest of time) kept to the same themes. Thanks to a really interesting lesson from Mike Kelly, I was much ore away of shape this time around. I decided I wanted a contrast in shape between the two characters- which I decided would be a robot for the engineer character, or a elemental or totem summon for the Shaman. I tried to bare in mind what Emma warned against with Shamans in the initial feedback session- beware of shamans because they are generally adorned with garments far too detailed and eloquent to design and model in the remaining time. Bearing this in mind, any designs of the shamanistic nature I designed from then on were heavily stylized to the extent where detail was inconsequential to the silhouette and characterization of the design. I felt I was in a good place with the shamans, but in the end, decided they were too simple. So I went with the robot and engineer. I settled on a design style I wanted for this quite early, and even decided to keep the cartoon 'white eyes' that were initially just for the purpose of silhouetting, I thought they added allot of character and also gave a direct link back to the robot, who shared the same blank white eye design. It just gave them the same 'in-universe' feel and I liked it. I tried to avoid assigning her characteristics during this stage of the game, but she grew on me, and the more she grew on me the more I found myself leaning and creating more creepy and unsettling types of designs for her. The reason I was so locked in on having a robotic arm was because I wanted it to be very clear she was an engineer, so I used the silhouette to try and communicate that, she isn't a soldier or a medic- no, her purpose is directly linked with her companion and is relevant to him. To get that feel, I used actual machine parts to reference that, while making sure that whatever her arm was, I'd know how to rig it and have it function as a regular arm if it came to that. 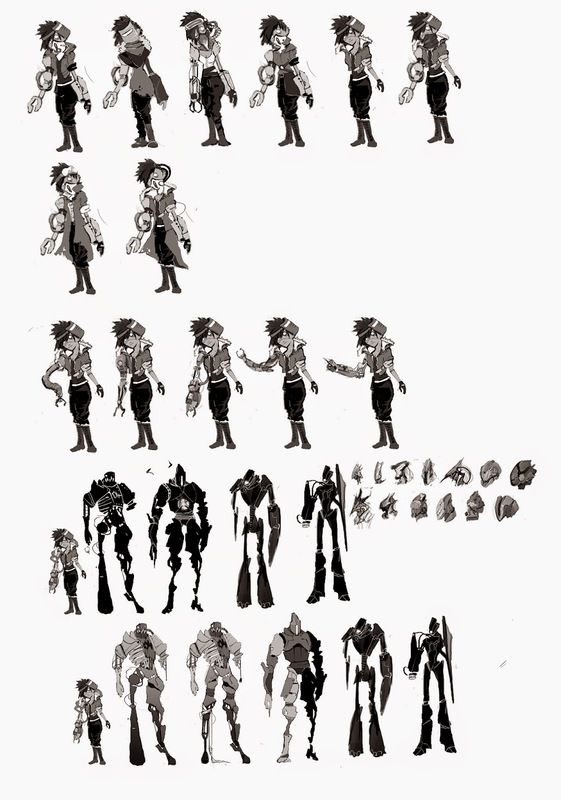 The problem I was finding thought is that she was becoming to robotic herself, and I wanted her to contrast with the robot, so I narrowed it down to more humanesque designs. 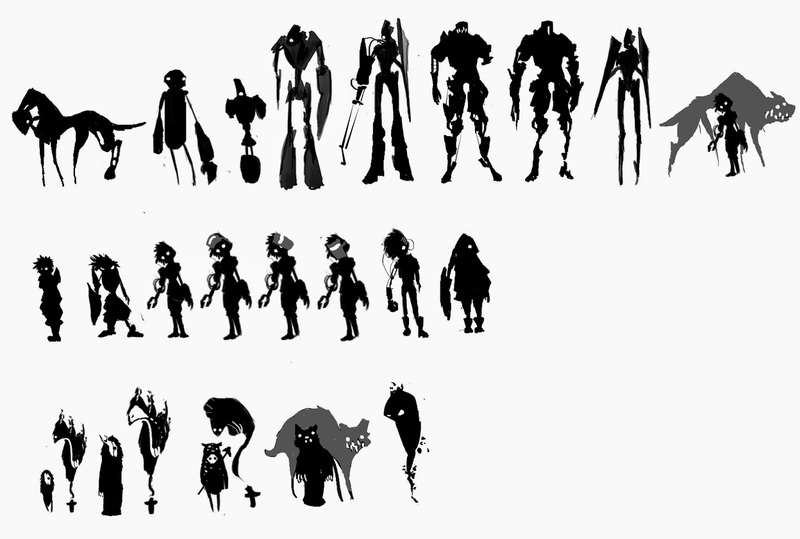 The robot designs came much more quickly and I found I didn't need to produce nearly as many before I found one that just felt fantastically right. I was immediately enamored with him and only felt the need to do a few more iterations before I settled. It's actually a shame, I would have been happy to spend the next week devoted exclusively to drawing robots, but time is key, and I need to move on. I'd actually come to a decision at this point, that I would model the human first- even though I vastly prefer the robot, because frankly, I just outright need practice modelling people, and the robot could be broken down into prop type things I've done before. So despite what might be a wiser, safer choice, I'm modelling the girl. For the good of the future and aw man I really wanted to model the robot.